This year we gathered over 2 days. Day 1 was for people with dementia and family carers and friends, Day 2 was for everyone. In Day 1, we started with people talking about things that mattered to them and that they would like to change. We also discussed the idea of Meeting Centres in East Lothian and whether this would hep us build on the great work going on across the county. 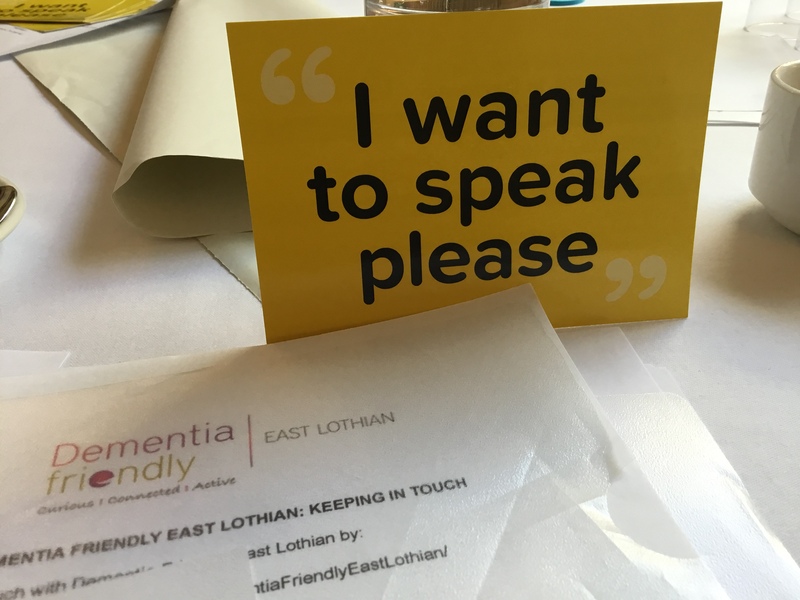 Day 2 was for anyone interested in dementia and focussed on Meeting Centres as a possible approach for East Lothian. East Lothian is a part of this new programme bringing Meeting Centres to the UK. We were delighted that the Meeting Centres discussion was led by Dr Shirley Evans, from the University of Worcester. Shirley runs the UK Meeting Centres Support Programme. Read more HERE. Meeting Centres are a local resource, operating out of ordinary community buildings, providing warm and friendly expert support to people living at home with dementia. At the heart of the Meeting Centre is a social club where people can meet to have fun, talk to others, and get great help that focusses on what they need. 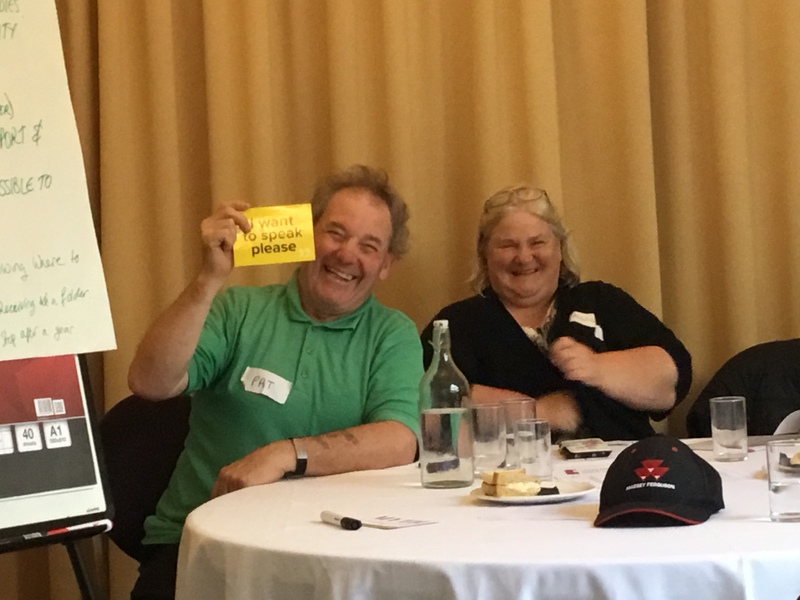 There is good evidence both from research that Meeting Centres can help people with dementia and their family/friends and carers adjust to life with dementia to feel more positive, connected and better able to manage life with dementia. 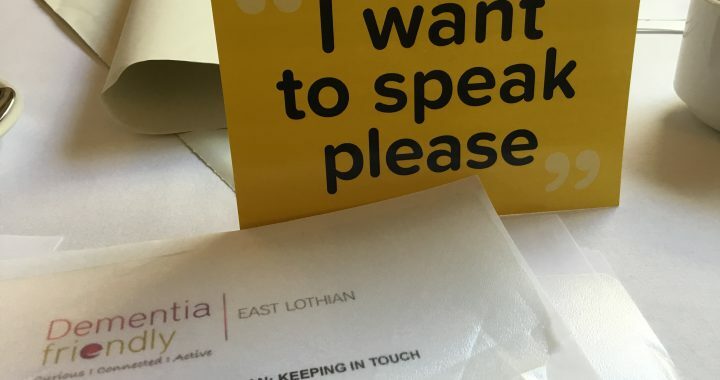 Meeting Centres are an important way of keeping active and feeling supported to manage the cognitive, emotional and social challenges of living with dementia. They provide accessible support and information at a local level. 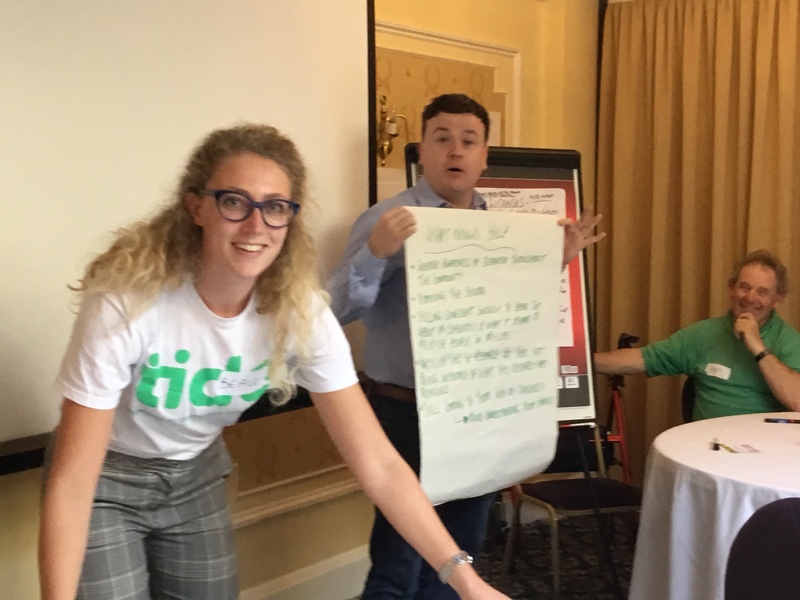 We were also very fortunate to be supported by Paul Thomas from DEEP (the Dementia Engagement and Empowerment Project) and Beau Nieuwenhujis, Amanda McCarren and Mark from TIDE (Together in Dementia Every Day) who facilitated the sessions, and so much more! Day 1 was for people who live with dementia all day, every day, either because they have dementia or are a family member, friend or care-partner for someone who does. In the morning we talked about what matters to us. In the afternoon, Shirley Evans from the Meeting Centres Support programme at Worcester University told us about Meeting Centres and we then talked about how they might work in East Lothian. These are the comments fed back to DFEL by Paul Thomas from the Dementia Engagement and Empowerment Project and Beau Nieuwenhuijs from Together In Dementia Everyday who facilitated these discussions. Living with dementia (and getting older!) is hard work, and people work hard to stay active, stay positive and maintain normal life. 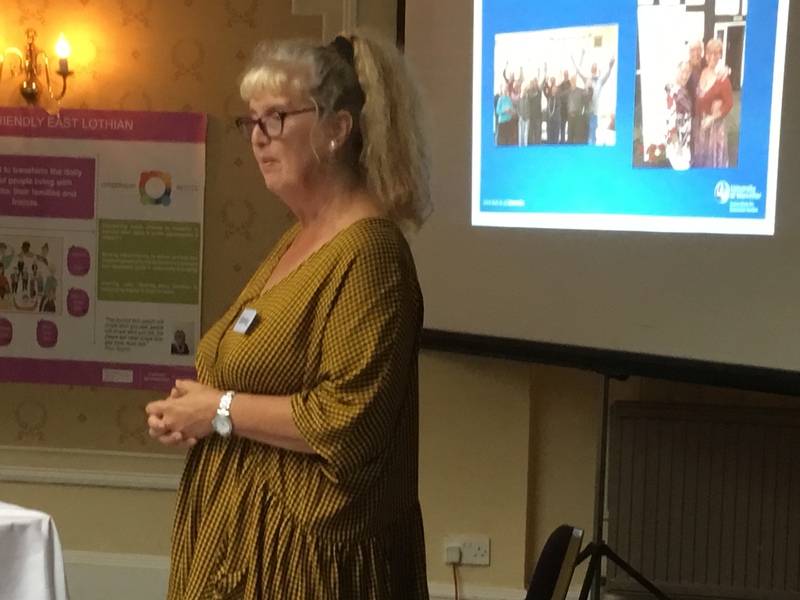 It’s important to stay involved and connected to the community, of all ages and to feel able to speak openly about what it’s like to live with dementia. We need to continue to raise awareness about dementia and challenge stigma. Relationships with family and friends are crucially important and there is a need for services like counselling to help people keep family relationships healthy and strong. We must also recognise that not everyone has family support. People get great support from spending time with others with similar experiences and this is crucial to living with dementia. Transitions, such as having to give up driving, are tough and people with dementia and carers want more help to manage this and better, more accessible public transport. People also want help to access their rights, for example to a comparative assessment, to have access to services and support from diagnosis to the end of life, not just for a year after diagnosis. Plus more open communication from professionals and better access to information. Services must get better at supporting people from diverse cultures and backgrounds, including more male buddies and carers. On Day 2 we invited anyone with an interest in dementia to join us to find out about Meeting Centres and talk about how they might work in our different communities. Dr Shirley Evans opened the day by telling up about Meeting Centres. Meeting Centres originated in the Netherlands and now operate across Europe. Shirley and colleagues at the University of Worcester have got funding from Big Lottery to develop Meeting Centres across the UK and East Lothian is part of the programme. You have to come to terms with life with dementia, stay positive, active and connected – this is hard work! We spent the rest of the day talking about Meeting Centres and how they might work in our different communities. We then got together to share ideas and thinking. People with dementia and carers must be at the heart of discussions about Meeting Centres, treated with respect and given choices. The outcome doesn’t have to be a Meeting Centre, this is the start of community conversations. 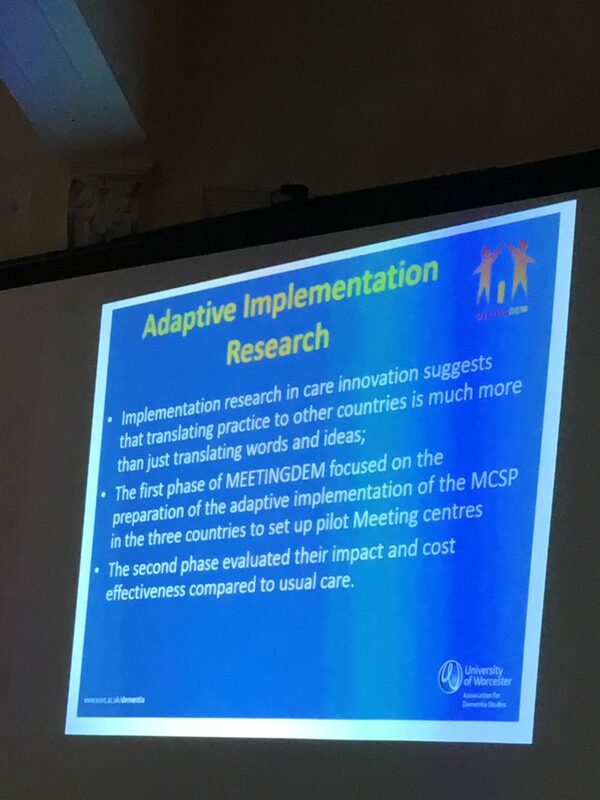 Centres should be for all people with dementia and their families, including people with advanced dementia and support/services to be sustained and developed not just at ‘key stages’. Centres are more than a building, it is about feeling included, part of the community and at home. That includes challenging attitudes to dementia as a community. There are many opportunities to build on what is already happening – groups, community assets – by joining up and being smart about how we use our assets; not duplicating or undermining what is already in place. What we create must be sustainable and accessible and develop – transport is key. 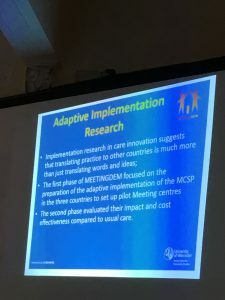 Will Meeting Centres work for people with advanced dementia? Should Centres include other groups or conditions or the whole community? What do we need to make it happen in our community? We worked in small groups talking about the the things that matter to us and that we want to address. People with dementia and carers worked together and separately to do this. Keep fit, design, a new life. Keep active, swim, gym, keep physically fit, helps my brain. Help people access their right to a comparative assessment – have I got worse or better? Get more male buddies, carers etc. Need for something in the later stages – can meeting centres fill that need? Make use of under used facilities in towns/areas – can this form meeting centres? Haddington has a blue print – who do we draw on? 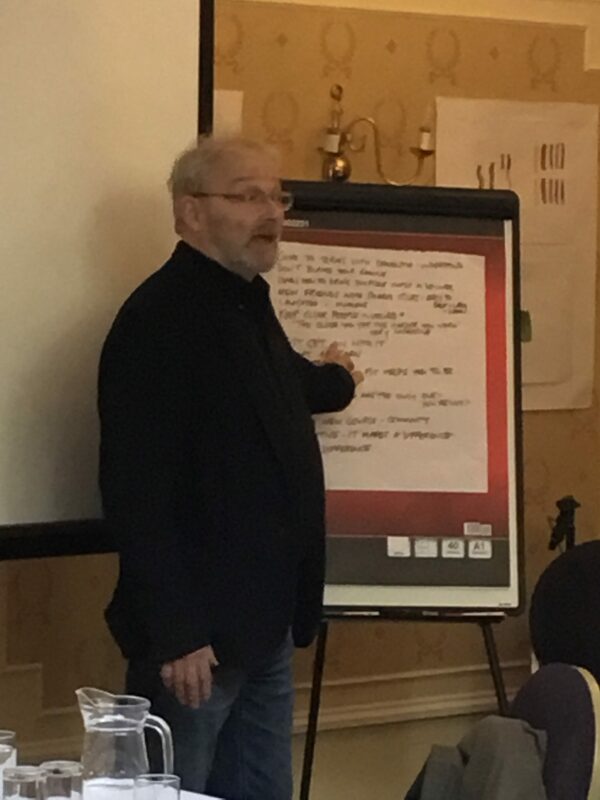 Theme 4 – we must work through community conversations to find out what the community has and wants. How do we find the right place? How long? Two hours is not enough. Should we look at Centres involving other groups or conditions or the whole community? Would that deflect us from dementia? What if people don’t want to go? Many people have dementia and another condition. Can others with conditions affecting the brain can it be accessible, can they be included? Will this take the focus away from dementia? Whoever does it needs oommph! We need to start/continue community conversations. Find out about and visit other Meeting Centres already running – ZOOM?